The thick vegetation is beginning to cure. 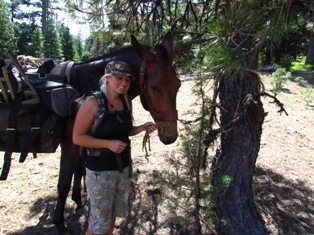 The vegetation was over my head, zigzagging through the corn stalk like shoots, my boots were sinking into the thick mud bog, with Otis in tow, every step was made quick to keep ahead of the mule’s enormous stride. Dad was just ahead, video camera in hand filming as we floundered towards him. Reaching the other side, my dad put the camera down and casually said that he had heard Elk. With the sounds of the mud holding my feet tight and the vegetation that was nearly taller than me filling my ears, I certainly had not heard any Elk. My father has questionable hearing on a good day, so I stood still and listened. Only moments later I hear it; the first bugle of the year. The nursery herd of cows, calves, spikes and rag horned bulls had been living in the area for more than two weeks and sure enough, one of the eager young bulls was singing his heart out, echoing the hauntingly beautiful sound across the mountainside. Knowing that Elk season’s opener was in less than two weeks, excitement was coursing through my veins, we kept going so not to disturb the herd below us. Otis was loaded with two tree stands, and a camera arm to aid in filming, we had a day’s work cut out for us and could not afford to waste any time. Jumping over fallen logs, side hilling across the mountainside, we walked right into them, a substantial herd of resident cows and calves, numerous spike bulls and one single branched rag horn bull. The herd was running down the mountain towards the bottom when they suddenly stopped to get a better look at us. While the herd was busy mewing and chirping, I took the opportunity to take video of them milling around the mountainside less than 80 yards away from us. A spectacular sight it was that lasted only a couple of precious minutes when they continued their decent down the mountain. Downloading my pictures onto my laptop. Checking my first of three locations, I found that a 6x6 and a 7x7 bull both still in the velvet had been in on the same day, August 14th. The 7x7 was definitely a relative to a bull that I had called in for my father over four years before as they have unmistakable webbing at the top of their antlers. I was excited to see this unique trait being passed down. As I stood there only one day later, I immediately knew that these were two bulls that I had not seen before. This spot in particular was known to have at least one nearby nursery herd of Elk and these two bulls were in there for one reason and one reason only, they were starting to move out of their summer ground feeling the rut approaching from within. Making our way across an open flat, the stripped tree immediately caught my eye. A bull had rubbed the velvet off of his antlers only hours before. His victim had been two trees set 30 yards apart. 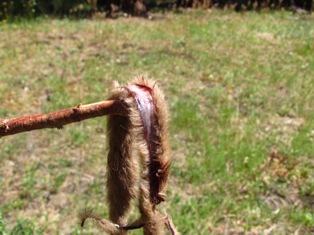 The tender velvet was so fresh the membrane that had attached it to the antler was still moist and bloody. The changes within the Elk had started to show seemingly overnight, hearing my first bugle, evidence of new bulls moving in from my trial camera pictures, and now finding this, I was excited beyond words! The bull had tore up this tree only hours before. The velvet was so fresh the membrane was still moist and bloody. Otis checking out the velvet. Eagerly I approached my trail camera and the location where I was going to hang my tree stand only to find out that I had neglected to turn the power on my camera when I had left it over 10 days before. 10 days of valuable information lost. There was fresh Elk sign and I knew there was at least two 300+ bulls that had been living in the area. Never the less, I was disappointed to have lost the opportunity to check my camera this one last time before the season opened. My dad I and I hung my stand and camera arm with confidence knowing in less than two weeks, I would be back to review my new trail camera pictures and have my shot at harvesting one of the magnificent bulls that were living on the ridge. Our next stop was to hang a stand for my dad. Fortunately, I had turned this camera on and had many pictures of Elk. The last photo of my larger 300+ class bull in this particular location was taken on the 25th of July; the herds of spike bulls and young branched bulls were still frequenting the area. The biggest notable change occurred on the 9th of August when the cows mixed with spikes and one rag horned bull appeared together on my camera. This location had been previously occupied by bachelor bulls only. 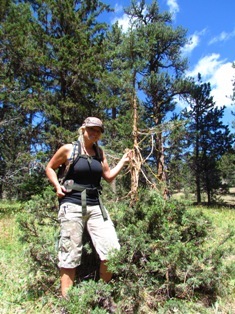 The tree was set for my dad’s return opening weekend and we walked out with very valuable information about the Elk behavior that would help us tremendously opening weekend. The bulls were beginning to feel the biological changes from within and were bugling, the older more mature bulls had began to scrape the velvet off their antlers and had started to move out of their summer range soon to begin territorial marking. The rut was close the Elk felt it and I saw it in their behavioral changes. When I return again during season in less than two weeks, the photos I capture, the sign I read, and what I hear echoing across the mountainside will all help me in planning my strategy for taking down one of the mature bulls I have been watching all summer long.